Pit your sheepshead skills against One Eye Jack, Crack Meister, Ace No Face and Queen Betsy. Sheepshead, THE Game is a fun, challenging and easy to use Sheepshead card game in which you play against four computerized players. 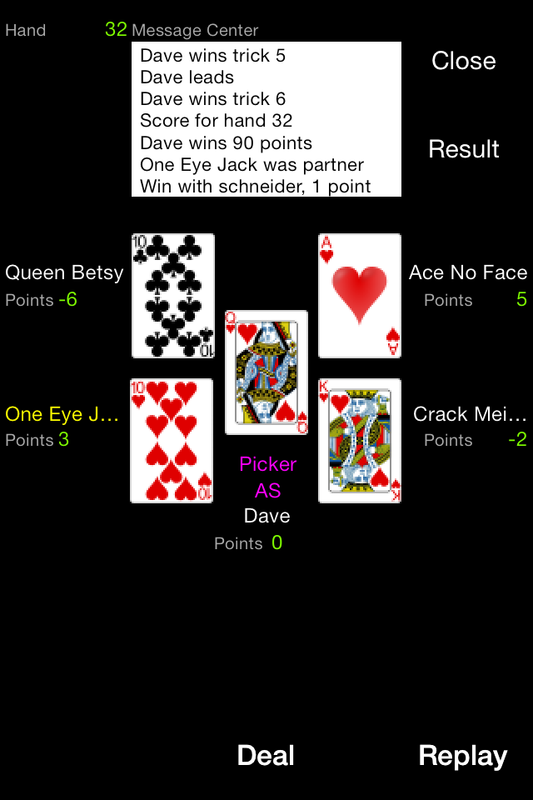 The game supports Called Ace or Jack of Diamonds as partner. Blitzing and cracking adds to the excitement. Sheepshead, THE Game is a great way to practice counting points and trump cards played. The game is rated 4.6 out of 5 on the Google Play market place! Sheepshead, THE Game comes in 3 versions, the Windows PC version, the Android phone / tablet version and the iOS iPhone, iPod, iPad and iPad Mini version. 11/02/2017 - Version 21 of Sheepshead, THE Game for Amazon and Version 12 of Sheepshead, THE Game for IOS was released. I made numerous changes to improve the card playing ﻿﻿logic. 10/28/2017 - Version 21 of Sheepshead, THE Game for Windows PC and Sheepshead, THE Game for Android was released. I made numerous changes to improve the card playing logic. 11/21/2015 - Version 16 of Sheepshead, THE Game for Windows PC and Android was released. I have improved the blitzing logic. I also made numerous changes to improved the card playing logic. 9/3/2015 - I am pleased to announce the release of Sheepshead, THE Game version 15 for Amazon smart phones and tablets. 11/10/2014 - Version 11.1 of Sheepshead, THE Game for Windows PC annd Android was released. This release fixed an issue with leasters. 11/1/2014﻿ - Version 11 of Sheepshead, THE Game for Windows PC was released. A new scoring method option was add. Standard scoring and double on the bump are the options. A few bug fixes in the the scoring logic were fixed. Numerous changes were made to improve the card playing logic. 8/17/2014 - Version 10 of Sheepshead, THE Game for Windows PC was released This version doesn't contain any new functionality. A few bugs were fixed regarding the discard card logic for Called Ace players. Numerous changes were made to improve the card playing logic. ﻿6/16/2014 - Version 3 of Sheepshead, THE Game for IOS was released. 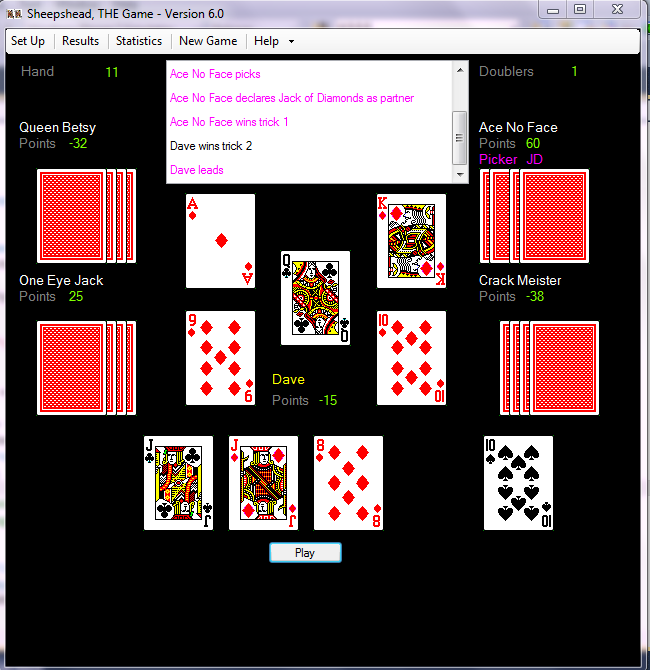 This version includes the option to view the cards as they were dealt. Numerous changes were made to improve the card playing logic (AI). 6/7/2014 - Version 10 of Sheepshead, THE Game for Android was released. This release doesn't contains any new functionality. Numerous changes were made to improve the card playing logic (AI). 4/12/2014 - Version 9 of Sheepshead, THE Game for Windows PC was released. This version includes the option to peek at your discards before playing a card on a trick, view the cards as dealt to each player plus numerous changes to improve the card playing logic. 1/12/2014 - Sheepshead, THE Game - Free Trial for Android was release. Play the game for free for 3 days with all the features and options of the paid version of the game. 12/23/2013 - Version 2.0 of Sheepshead, THE Game for IOS was released. This version includes the option to peek at your discards before you play a card and an option to have the game speak the contents of the message board. Fixed a bug not allowing the retention of the no picker option and a bug in the doublers option. Plus numerous changes to improve the card playing logic. 12/14/2013 - Version 9 of Sheepshead, THE Game for Android was released. This version includes the option to peek at your discard before you play a card, the ability to display the previous hand's cards as dealt by player and numerous changes to improve the card playing logic. ﻿﻿11/15/2013 - Version 8 of Sheepshead, THE Game for Android was released. This version includes the option to display the blind if all players pass. Your discard will be visible when switching screens. Plus numerous changes to improve the card playing logic. ﻿11/2/2013 - Version 8 of Sheepshead, THE Game for Windows PC was released. This version includes a new Set Up window, the option to display the blind if all player pass, your discard will be visable until the first card is played, numerous changes to improve the card playing logic plus more. 9/29/2013 - Version 1 of Sheepshead, THE Game for iOS was released. You can now play Sheepshead, THE Game on your iPhone, iPod, iPad and iPad Mini. 6/7/2013 - Version 7 of Sheepshead, THE Game for Android was released. 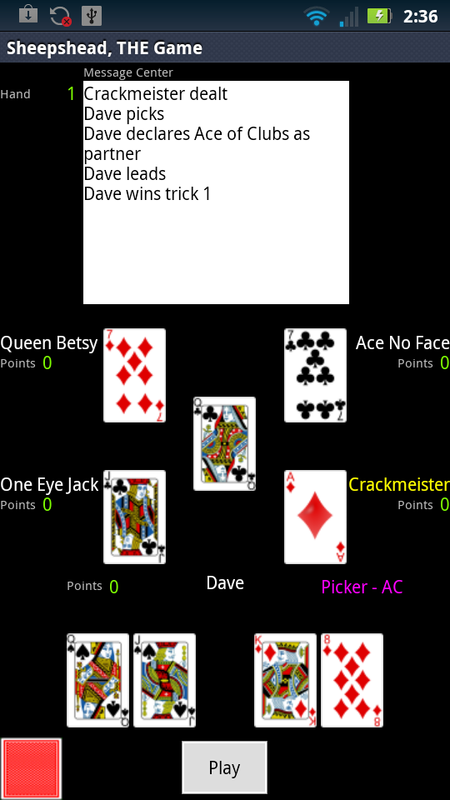 This version includes leasters, improved picking logic, bug fixes and numerous changes to improve the card playing logic.